Just because you work from home doesn’t mean your place needs to look like an office. Sure, some professional touches will stand out from the rest of your decor out of simple necessity but that doesn’t mean your creative side can’t come out and make your place stylish in a way your cubicle would never be. One fairly large office item that needs storage is your printer. Back in the DOT-matrix days, your printer was large, cumbersome, usually an uncomely tan in color . . . not something you’d want to make a centerpiece in your home. Nowadays, printers are smaller and more sleek, which makes their presence in your home more welcome. Smaller printers are now designed to use space more efficiently, which also means they are much easier to stow away. Thanks to wifi technology available on nearly all new printers, you can tuck them anywhere for storage as long as they have access to a power outlet so you don’t have to disconnect them. 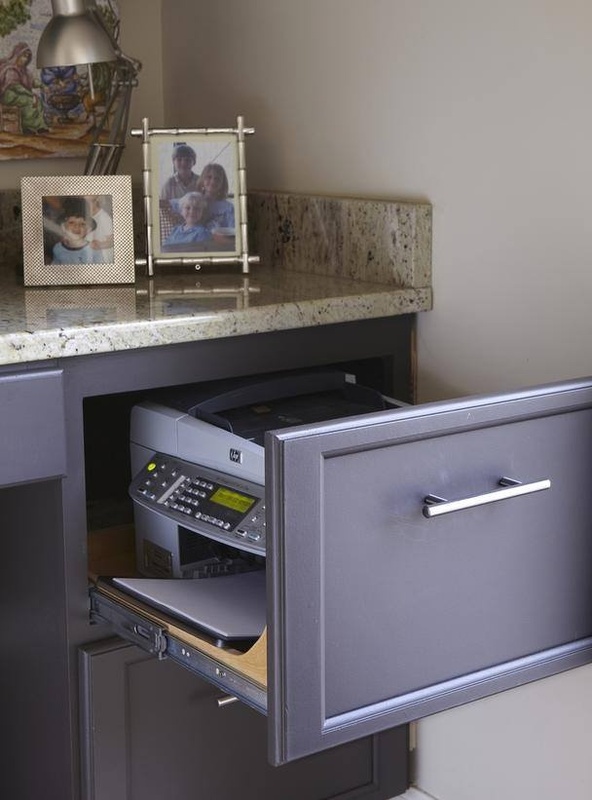 The key is finding somewhere your printer can integrate into your decor, concealed in plain sight among everything else in your home office yet easily accessible when you need it. As tempting as it is to tuck your printer beneath your desk, you should be aware that printers accumulate dust under your desk which can cause clogging problems for your print heads when they aren’t in use. 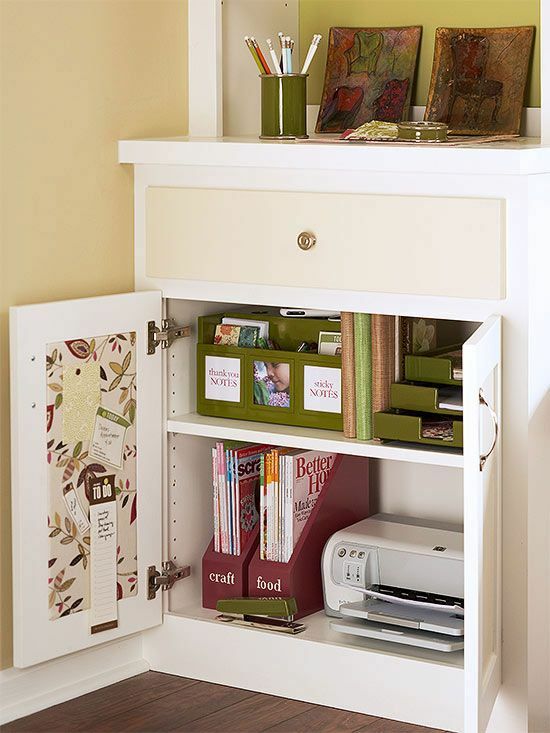 Any dresser or desk where you have an available drawer or cabinet can be retrofitted to accommodate your printer. 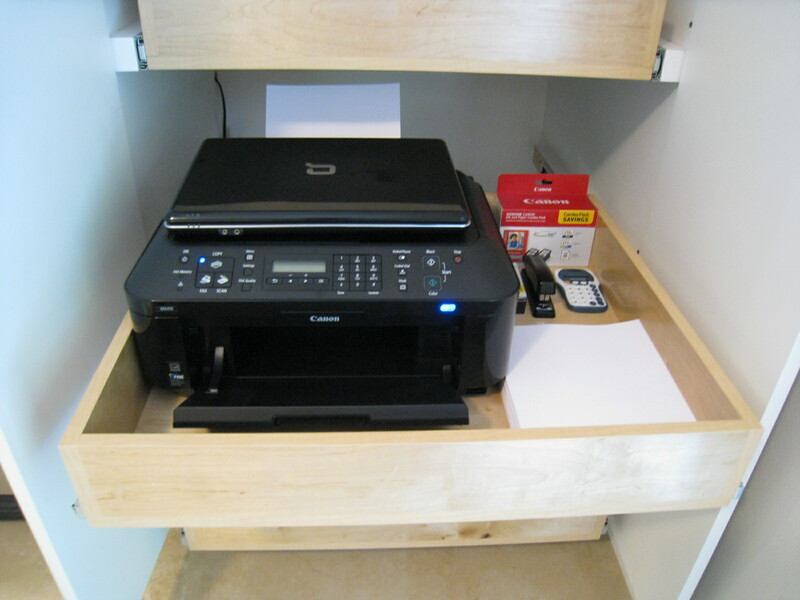 Several tutorials online give you tips on how to make your drawer face tilt down, making access to your printer quick and easy. Drill a hole in the back of the drawer for the plug and you’re ready to go! 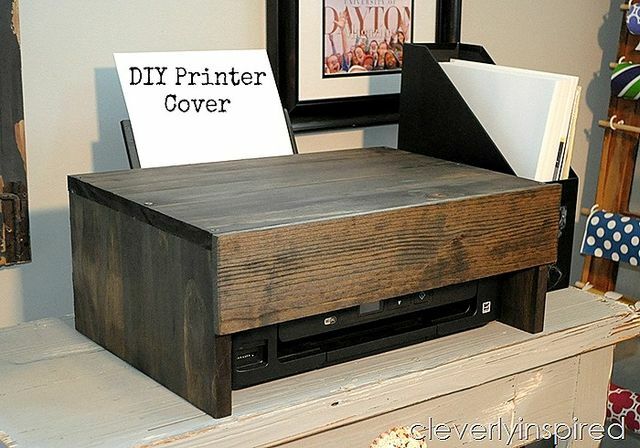 If you have unused drawers or cabinets in your media center, put your printer in them. Chances are your media center has great access to electricity, which combined with wifi networking means you can print from anywhere in your home without having to move. You can also refit your drawer face to tilt down, as described above, for easier access. Your printer doesn’t need to be in your office either. Got some extra space in your pantry or a linen closet? 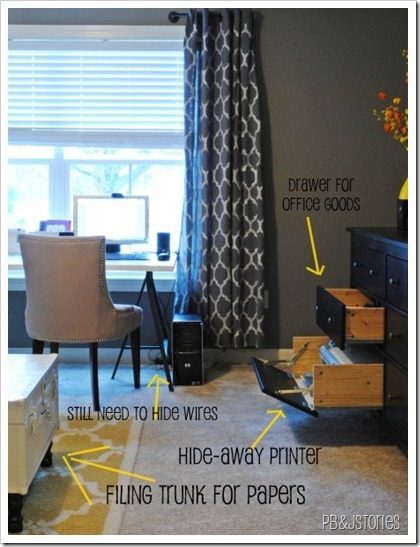 If you can create easy access to an electrical outlet, go for it! Side tables aren’t just for lamps. A lot of side tables offer more storage space than you’d expect. Plus, much like your media center, side tables are often placed near outlets to power lamps, meaning you can plug your printer in as well. 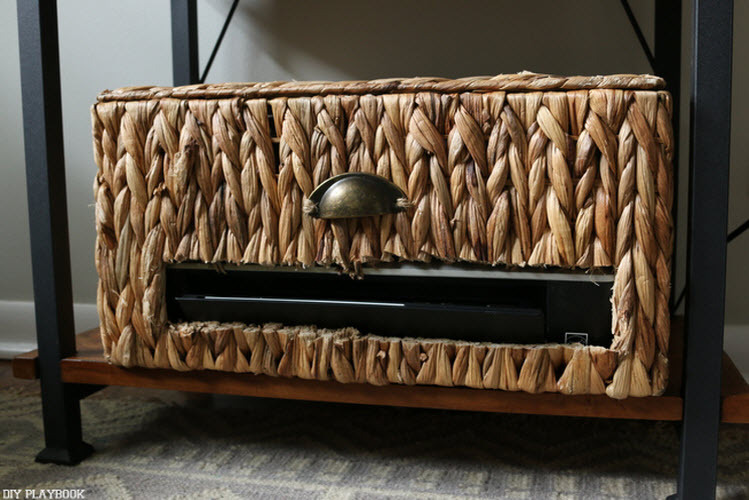 Perhaps the most innovative way to store your printer is to design a custom printer cover to match your decor. 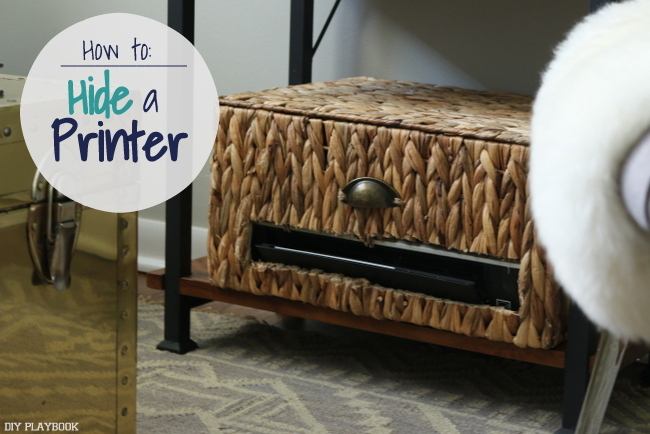 With a little crafty ingenuity, you can accent a cardboard cover to compliment your personal style and store your printer in plain view without taking away from your other decor. No matter the size and layout in your home, there are dozens of places in your home to store your printer. 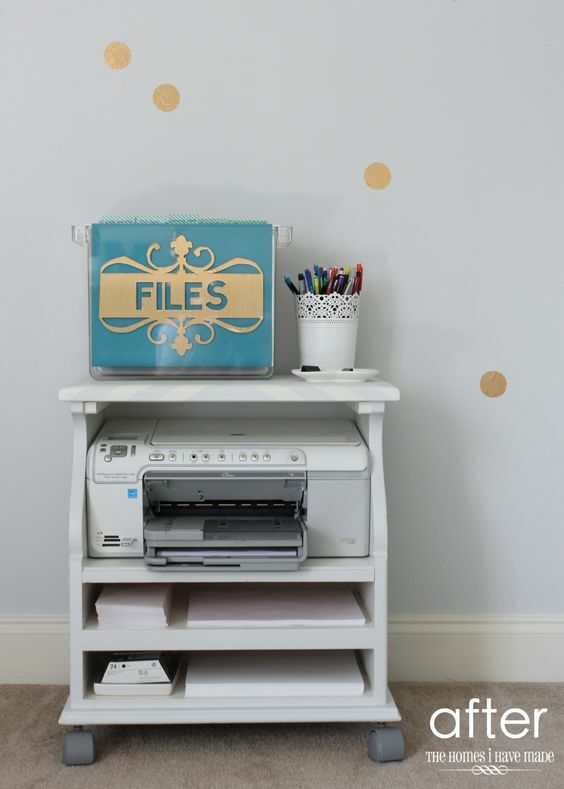 Have any other creative solutions for storing your printer? Drop them below in the comments!